This Vertical Bridge 178-foot self-supporting tower constructed in 2012 was one of multiple structures that collapsed. Located off of Lisenby Ave. in Panama City, Fla., it broadcast iHeartRadio FM radio station WPAP. When Hurricane Florence slammed into North Carolina on Sept. 17, it kayoed 718 cell sites, according to the FCC’s Disaster Information Reporting System (DIRS) which listed the counties that could suffer service interruption in four states. 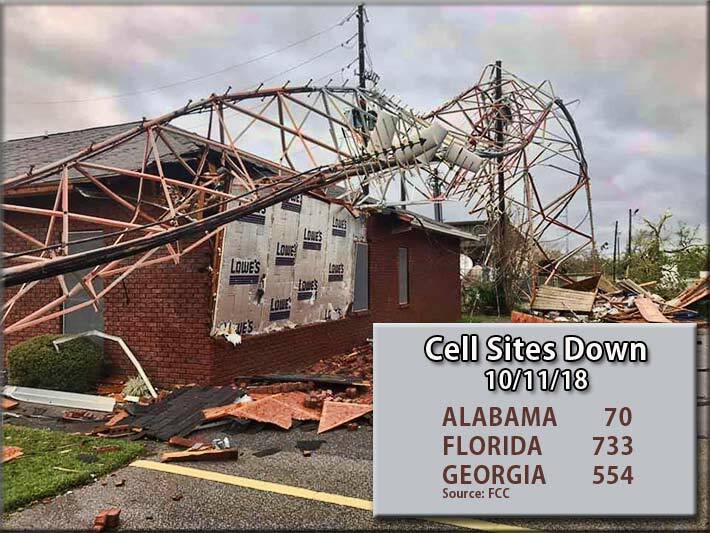 Hurricane Michael, the third-most powerful storm on record to hit the U.S., and the worst in 50 years, has almost doubled the number of cell sites down according to their Oct. 11, 2018 DIRS that identifies (see full county listings below) 1,357 sites being out of service in just three states, Alabama (70), Florida (733) and Georgia (554). In addition, according to Wireless Estimator sources, some sites are also down in South Carolina after the hurricane came through Charleston with gusts of 55 miles per hour. Although Hurricane Florence’s outages were primarily caused by alternate power resupply and backhaul problems that were hampered by days of flooding, according to industry observers, Hurricane Michael most likely created structural damage to cell sites with its winds reaching 155 mph, adding to site failures. Mexico Beach, Fla. was the hardest hit community when Hurricane Michael came on shore. Located in Bay County which has 78% of its cell sites out of service – 256 out of 326 sites – the popular tourist community has little cell service and reporters covering the devastation there have had difficulties in connecting to their broadcast networks. Whereas a 153-foot American Tower monopole survived Hurricane Michael’s onslaught in that demolished community, its tenant, Verizon, appeared to have its mounting frame and antennas damaged, as identified in a Wireless Estimator article. Cable and wireline companies’ subscribers out of service in Hurricane Michael’s impacted area were: Alabama, 14,885; Florida, 185,841; and Georgia, 63,473. Thirty FM radio stations have reported that they are out of service; 4 AM radio stations are out of service; and 4 TV stations have reported to the FCC that they are also down.